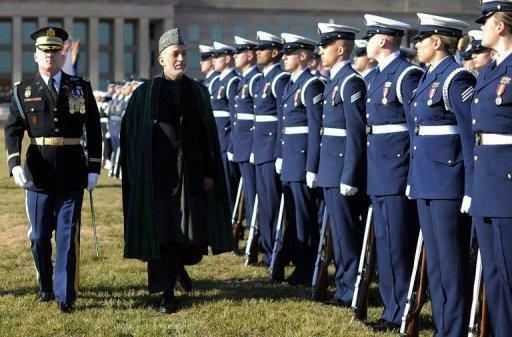 Afghan President Hamid Karzai attends a military ceremony at the Pentagon in Washington DC on January 10, 2013. The US sought to assure Karzai that it would remain committed to his country even as US officials weigh a major withdrawal of American forces. The United States sought to assure Afghan President Hamid Karzai that it would remain committed to his country even as US officials weigh a major withdrawal of American forces. After an elaborate military ceremony outside the Pentagon on the eve of Karzai's White House talks, Defense Secretary Leon Panetta told his "distinguished visitor" that more than a decade of war had paved the way for Afghanistan to stand on its own. "After a long and difficult past, we finally are, I believe, at the last chapter of establishing a sovereign Afghanistan that can govern and secure itself for the future," Panetta said on Thursday. "We've come a long way towards a shared goal of establishing a nation that you and we can be proud of, one that never again becomes a safe haven for terrorism." Panetta later told reporters he had met alone with Karzai for about an hour, adding: "I think it's fair to say that we made some very good progress on all of the key issues that we discussed." Since US-led troops toppled the Taliban in 2001 after the September 11 attacks, the Afghan president has had a stormy relationship with his US allies. The Panetta talks came ahead of Karzai's crucial meeting on Friday with President Barack Obama at the White House, which is expected to focus on how many American troops will remain in Afghanistan after the 2014 drawdown. 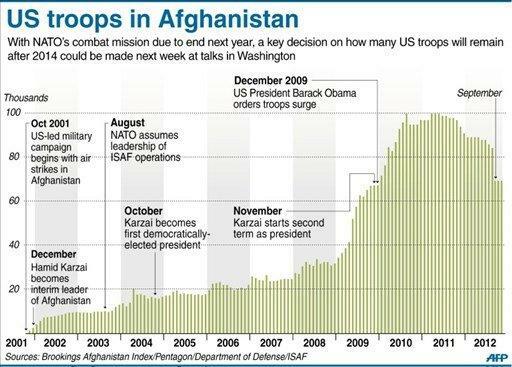 Obama, newly elected to a second term, is charting a plan to pull most of the 66,000 US troops out of Afghanistan -- well down from a high of about 100,000. The United States and its NATO allies have already agreed to withdraw combat troops by the end of 2014, but questions remain on a US training and security role after that. Throughout his visit, Karzai is expected to push for a substantial US military presence in Afghanistan after 2014. But some White House officials favor only a light footprint of several thousand troops, and Ben Rhodes, a deputy national security adviser, even suggested Tuesday the United States might pull out all of its troops. US military officers privately acknowledged those comments about a total withdrawal were primarily designed as a tactic in negotiations with Kabul. Karzai also met later Thursday with US Secretary of State Hillary Clinton, for talks and an official dinner. Among the issues topping their meeting were progress on reconciliation talks with the Taliban, as well as the distribution of US aid to Afghanistan. Karzai has pressed for more US assistance to be channeled directly into Afghan coffers, instead of being distributed via non-governmental and aid organizations. State Department spokeswoman Victoria Nuland said discussions were underway, but corruption remained a major concern in Afghanistan. The US Special Inspector General for Afghanistan Reconstruction, John Sopko, also warned Thursday that vast amounts of US aid could be wasted without better planning and security. "We are at a risk now of wasting billions of dollars if the agencies charged with implementing new programs and constructing new facilities do not first answer some basic questions," Sopko told the Stimson Center think tank. Clinton welcomed Karzai at the State Department and hosted a small dinner attended by only around 15 people including Panetta and National Security Advisor Tom Donilon. "This is a great opportunity for us to attempt in a very small way to repay some of the hospitality I've enjoyed over the years," she said as they sat down around an ornate dining table set with the best glassware and flowers. Karzai thanked Clinton, after earlier telling Panetta he was hopeful the two countries would work out a deal for a future US military role beyond 2014. "Afghanistan will, with the help that you provide, be able to provide security to its people and to protect its borders; so Afghanistan would not ever again be threatened by terrorists from across our borders," he said. 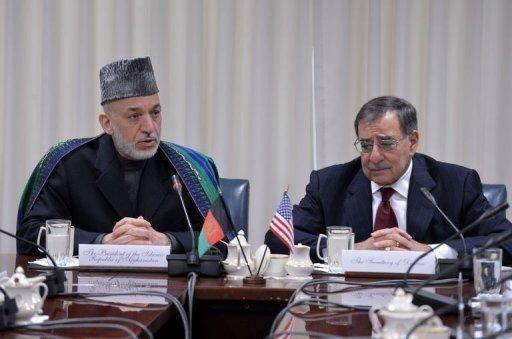 Karzai also voiced confidence the two countries can "work out a modality for a bilateral security agreement that will ensure the interests of Afghanistan and also the interests of the United States."